Meade Internet has several search engine optimization packages to choose from. Starting from search engine optimization of your home page, to a complete optimization of your entire site, we can help you get noticed in the search engines, build traffic, and bring in leads. At Meade Internet, we don't take a "cookie cutter" approach to SEO - that's part of the personal service we guarantee our clients. Effective SEO is also labour intensive, and requires an ongoing effort to be successful. We offer a website maintenance package that addresses this fact. Once we've analyzed your website, we'll propose a SEO strategy and pricing model that is tailored to your website and needs. Optimization of the main page of your site. Package includes keyword analysis, creation of keyword rich text copy, (two keywords or keyword phrases maximum) meta tag revision and manual submission to 5 top search engines and directories. Package also includes a Search Engine ranking chart within 90 days. Optimization of up to 5 pages of your site. Package includes for each page: keyword analysis, creation of keyword rich text copy, (one keyword or keyword phrase per page) meta tag revision and manual submission to 10 top search engines and directories. Package also includes a Search Engine ranking chart within 90 days. Optimization of up to 20 pages of your site. Package includes for each page: keyword analysis, creation of keyword rich text copy, (one keyword or keyword phrase per page) meta tag revision and manual submission to 10 top search engines and directories. Package also includes a Search Engine ranking chart within 90 days. Contact us at info@meadeinternet.com and we would be happy to discuss your search engines optimization needs with you. Prices do not include GST/HST (in Canada only). Prices are subject to change without notice. We take pride in the top ten rankings we achieve on behalf of our clients. 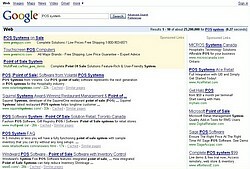 Click on the links below to see some screen shots of actual top ten search engine rankings on Google, Yahoo! and MSN.